Following a period of relative volatility during May, when prices staged a sharp rally before quickly returning to their previous trading range, international cotton prices during June maintained a fairly steady trajectory. Asking rates drifted downward, influenced by persistently lower settlements in New York throughout most of the month. 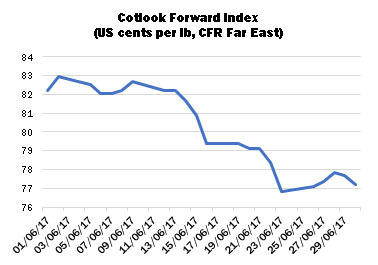 The Cotlook A Index started the period close to its high point of 87.7 US cents per lb, and retreated more or less steadily, falling to its lowest level since late January on June 22 (82.60 cents per lb), though still considerably above the A Index’s long-term average, which is close to 70.00 cents. Prices subsequently reversed direction, registering modest increases, to end the period at 83.30 US cents per lb. The Forward (2017/18) A Index, reflective of next season’s offering rates, for shipment no earlier than October, continued to show a significant discount throughout the period compared with the current season’s values. At its narrowest, the differential was below 400 cent points, but by the end of the month forward values were displaying a discount of over 600 cent points in relation to nearby prices. The anticipated rise in production next year therefore continues to present a bearish outlook for new crop prices. On the business front, the tight supply situation concerning Northern Hemisphere 2016/17 crops was exacerbated by persistent nearby mill demand, particularly for the most desirable origins, which had already begun to become difficult to source in May. US shippers continued to add to their already impressive commitments for shipment during the current season. 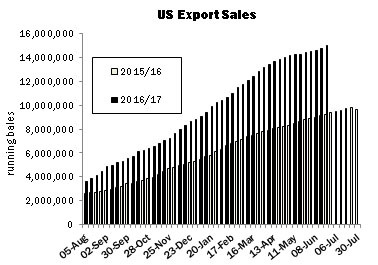 In June’s USDA supply and demand report, the Department maintained its projection of exports in 2016/17, at 14.5 million 480 lb bales, the second largest US export total on record. More active demand for third quarter delivery and beyond also emerged during the period under review. Some mills added to their inventories from Southern Hemisphere crops, including Australian and Brazilian cotton (whose shipment periods fill the supply gap which often materialises during summer months, ahead of the movement of Northern Hemisphere new crops later in the year). Selected Far East spinners, including those in Vietnam, where supplies are frequently bought with a fairly short delivery timeframe, are thought to have covered a considerable proportion of their requirements up to the end of 2017 and beyond, illustrating to some extent spinners’ willingness to deviate from the hand-to-mouth buying strategy which had been in place throughout much of the year so far. Some observers have commented that mills in Bangladesh may be forced to reconsider their buying operations given the extremely tight supply that has emerged for certain popular origins, such as those from the African Franc Zone and Central Asia. The latter origin was virtually sold out by the end of June, while the former was confined to remnant trade holdings. Over the longer term, exportable surpluses in Central Asia are expected to become smaller, as production stagnates or declines, while the proportion of crop consumed domestically increases, in particular in Uzbekistan. The authorities in that country are aiming for a situation whereby all domestic cotton is consumed by the local textiles sector. If those ambitions are achieved, a further diversification of import origins on the part of Bangladesh’s mills may result. Cotton Outlook continues to foresee a strong rise in world production during the 2017/18 season. Global output is estimated at just over 24,700,000 tonnes, a rise of more than 1,900,000 tonnes (8.4 percent) from the figure for 2016/17. Next season’s forecast of production was raised by 224,000 tonnes during the month, mainly as a result of adjustments for Mexico, Turkey and Brazil, influenced by the firm prices obtained for cotton in 2016/17 and the relatively poor remuneration for competing crops. The production outlook in the United States and India came under considerable scrutiny during June. Our assessment of production in the US was maintained at the 19.2 million bales last forecast by USDA but may be adjusted downward following the release of USDA’s Planted Acreage report, on the last day of the month. The report placed upland cotton plantings at 12.055 million acres, down modestly from the 12.23 indicated in the March Prospective Plantings report. Very hot temperatures were in evidence over major growing area West Texas during June, suggesting that dryland yields may suffer, and abandonment could prove higher than hitherto assumed. In India, our production figure has been maintained, though that lack of movement belies the close attention that was paid to crop prospects during the period. The Southwest monsoon, after making landfall slightly early, stalled before reaching some major growing regions. Nevertheless, by late in the month, the monsoon had resumed its trajectory and planting was expanding rapidly. 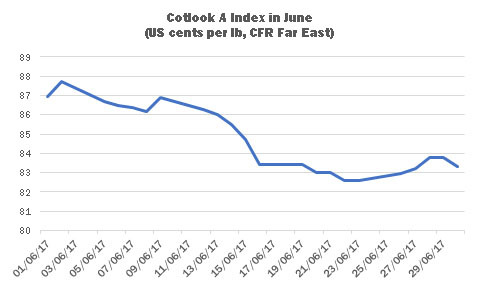 Changes made to consumption figures in Cotlook’s June assessment primarily concerned Indonesia and Uzbekistan, which saw increases of 70,000 and 60,000 tonnes, respectively. World consumption in 2017/18 is forecast at 24,545,000 tonnes, reflecting season-on-season growth of 1.9 percent. A modest addition to world stocks, of 176,000 tonnes, is thus foreseen by the end of the 2017/18 season. However, the semblance of equilibrium in the global figures conceals a sharp disparity between the position in China and that in the rest of the world. Inside China, our assessment continues to imply a considerable reduction, of nearly two million tonnes, to stock levels at the end of next season, owing entirely to the disposal of State Reserve cotton via the auction process that is forecast to continue in 2018. 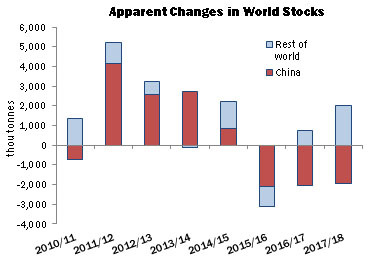 Outside that country, our figures imply an addition that will more than offset the reduction in China, resulting in an addition to ‘rest of world’ stocks of more than two million tonnes.